Given his prodigious output, readers unfamiliar with Pratchett’s work may wonder at the best place to start. 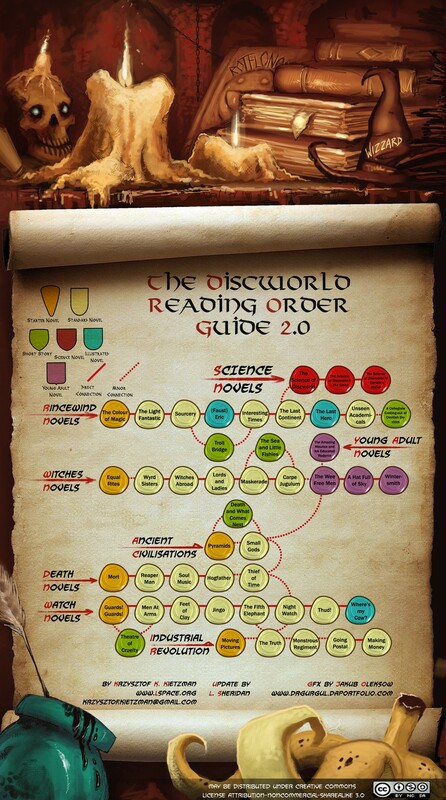 This handy graphic might be useful in making that determination; it lists all of the Discworld novels, grouped by storyline and arranged chronologically, with the connections between individual novels mapped out. Personally, I’d suggest beginning with Small Gods; it is almost entirely stand-alone but provides a great introduction to the Discworld setting and Pratchett’s characteristically humorous and satirical style. No one is finally dead until the ripples they cause in the world die away — until the clock he wound up winds down, until the wine she made has finished its ferment, until the crop they planted is harvested. The span of someone’s life, they say, is only the core of their actual existence. By that measure, Terry Pratchett will live on on our bookshelves forever. Jesse, a very fitting tribute!